(Documentary, United States) A story of love, loss, and redemption, focusing on the impact of a unique dog training program that gives two of the most marginalized populations in our society — prison inmates and veterans — a second chance. Filmed at Fishkill State Correctional Facility in New York, the documentary follows three inmates serving long-term sentences for murder and armed robbery. Typically, the men spend their days mired in a tangle of frustration, regret, hopelessness, and anger. Enter Gloria Gilbert Stoga, a feisty, brilliant dog expert with a tough love, no-nonsense attitude and a firm belief in second chances. Gloria runs the program, Puppies Behind Bars, which teaches a select group of inmates to train puppies to become service dogs for disabled veterans, whether suffering from PTSD or physical injuries that render them immobile. The process is daunting; inevitably, there are failures, both human and canine. It is a stressful and often overwhelming task to care for and train a young puppy to perfection, particularly within the confines of prison. The men face ridicule and threats from inmates who are not in the program and resentment from the guards. Gloria is a challenging and demanding instructor who accepts no less than 100 percent. One misstep, and a man can easily be kicked out of the program or have his puppy taken from him. And yet, in spite of feelings of self-doubt, the inmates discover the merits of responsibility, accomplishment, and helping others. Though it’s difficult for them to part with their canine charges after bonding so closely with them for two years, they’re proud to see how transformative the dogs are for the veterans who inherit the dogs they’ve trained. Men and women who were once afraid to leave their homes are able to venture out into the world again. Those who are physically disabled now have a companion to assist them at all times. The grateful veterans make sure to update the inmates about the dogs’ progress and well-being. The new friendship formed between prisoner, veteran, and dog is as unconventional as it is profound and is, in many ways, invaluable to each. 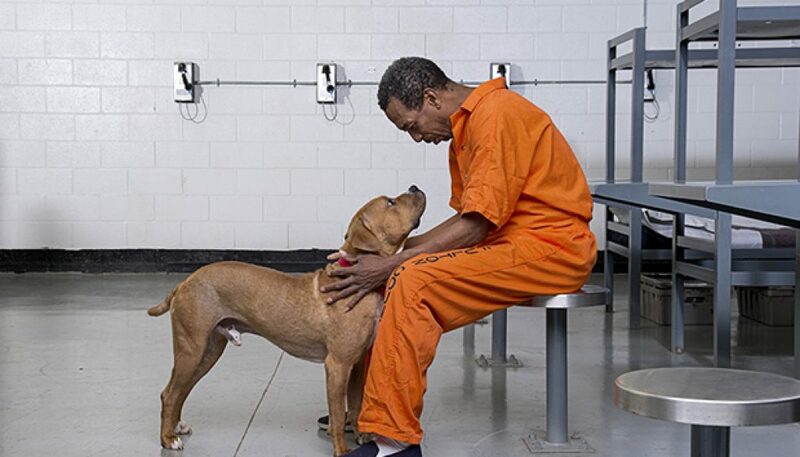 Prison Dogs captures in detail how the powerful relationship between humans and animals can restore the lives of those deemed impossible to save. Lives are saved both behind bars and at home for those newly returned from the battlefield. It is a story of hope, one that not only posits that people can change, but illustrates a very real way in which it can be done. Perri Peltz is a distinguished journalist and public health advocate. She is currently co-directing and co-producing a “Conversation” series on race with The New York Times Op-Docs. She co-directed and co-produced the documentaries, “Remembering the Artist Robert De Niro, Sr.” (Sundance Film Festival; HBO) and “The Education of Dee Dee Ricks” (HBO). Perri executive produced “A Journey of a Thousand Miles: Peacekeepers,” which screened at the United Nations, hosted by UN Secretary-General Ban Ki-moon, following its premiere at the 2015 Toronto International Film Festival. Perri is currently in production on a film about alcoholism in the U.S. for HBO. Perri hosts two radio shows on the SiriusXM Network: “The Perri Peltz Show” and “Doctor Radio Reports.” Her earlier work as a television news journalist includes serving as a reporter and anchor for WNBC, a contributor for NBC’s “Dateline,” an anchor at MSNBC, a news correspondent for ABC’s “20/20,” and an anchor for CNN. Geeta Gandbhir has been nominated for three Emmy Awards and has won two. As editor, films have been nominated twice for the Academy Award, winning once, and have also won three Peabody Awards. A feature documentary she produced with Perri Peltz and directed with 2x-Academy Award Winning director Sharmeen Obaid-Chinoy, A Journey of A Thousand Miles: Peacekeeperspremiered at the 2015 Toronto International Film Festival and screened at the United Nations. She is currently co-directing and co-producing a Conversation series on race with The New York Times Op-Docs, and she co-directed and edited the film, Remembering the Artist, Robert De Niro, Sr. with Perri Peltz for HBO. Additional notable works as an editor include, Mr. Dynamite: The Rise of James Brown,Whoopi Goldberg Presents Moms Mabley for HBO, which was nominated for an Emmy, When the Levees Broke, By the People: The Election of Barack Obama, Music By Prudence, Budrus, If God Is Willing and Da Creek Don’t Rise, and God is the Bigger Elvis which was nominated for the 2012 Academy Awards. Her film, Which Way is the Frontline From Here? with author and Academy Award nominated director Sebastian Junger was nominated for the 2014 News and Doc Emmys.